Spring has sprung, as they say. 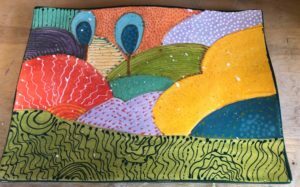 We love spring around Clay Café Studios. We open the windows and doors and paint, paint, paint! We have tons of other ideas! 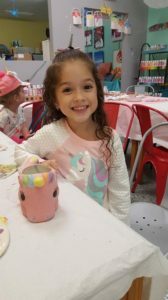 Come see us at #ClayCaféStudios and we’ll help you create a spring masterpiece! It’s that time again when schools, daycares and not-for-profit organizations search for off-site field trip destinations and on-site event ideas. 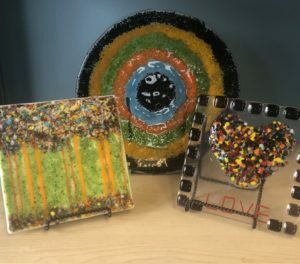 This year, the Contemporary Ceramic Studios Association (CCSA) is inviting planners to try some new, fun, educational and memorable activities at their local paint-your-own pottery studio (PYOP) or by inviting that PYOP to come to them. PYOP studio owners are available to provide guidance, advice and support to ensure a flawless, fun experience for all involved. All materials and step-by-step instructions are provided by trained and friendly studio hosts. Participants get to keep a unique keepsake of the experience. PYOP staff takes care of all clean-up. PYOP studios have a comfortable and creative indoor environment. PYOP studios are typically located in areas that offer plenty of free parking. CCSA-member PYOP studios meet ADA compliance standards. Planners can take pictures of the event of field trip, which are perfect for publishing in newsletters and sharing on social media. PYOP studios are typically run by small business owners – many of them families- who have deep roots in the local area. Businesses, organizations and schools that support PYOP studios are strengthening their communities. Clay Café Studios is a proud member of the CCSA. Call us at 703/534-7600 or come by to see us and we’ll help you plan your next event! Mother’s Day will be here before we know it. Motherhood is a demanding, exhausting, humbling and rewarding experience. Our Moms do everything for us. Mother’s Day is a day to thank Mom for all those things she does, both big and small, just because she loves us. Let’s face it, Moms really like it when we spend time with them. 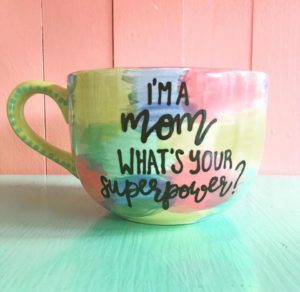 How about a pottery date for you and Mom? It’s a fun and relaxing way to spend the afternoon with each other. The added bonus is that you have a memento from that day. 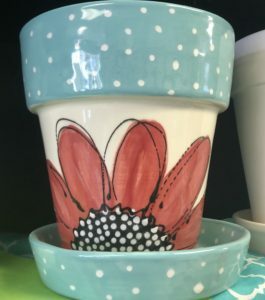 For the Mom that is the family gardener, how about painting her a flower pot? Once its fired, you can plant a beautiful lavender plant or the flowers of her choice. This is where Dads come in. Why not bring your baby or toddler to our studio and get their handprint or footprint on pottery? This is a special memento that Mom will cherish forever. 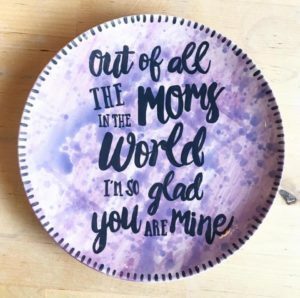 You could paint a plate listing all the things you love about Mom. Tell her why she is remarkable and how you can’t live without her. These are just a few ideas for Mother’s Day. Come in to the studio and we can show you more! 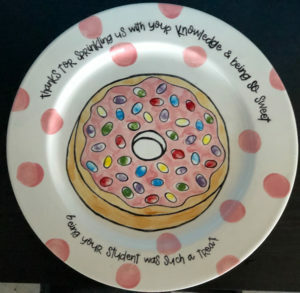 Need some new dinner plates? How about a new mug or bowl for your morning routine? Handprints, footprints and sweet sentiments are perfect for Mother’s Day and Father’s Day gifts. 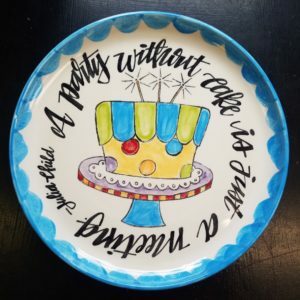 Hand-painted pottery is a great way to thank a special teacher. 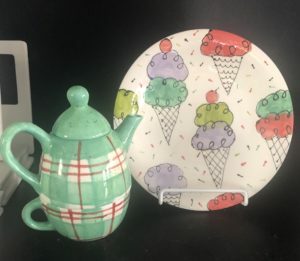 We are open all week and would love to see you at #ClayCafeStudios!